Universal Oil provides the highest quality fuels including regular unleaded and on/off road diesel. All fuels can be delivered or picked up at our 24/7 island fueling station. Our diesel fuel is additized in the summer and winter to help fuel economy and protect against harsh weather conditions. 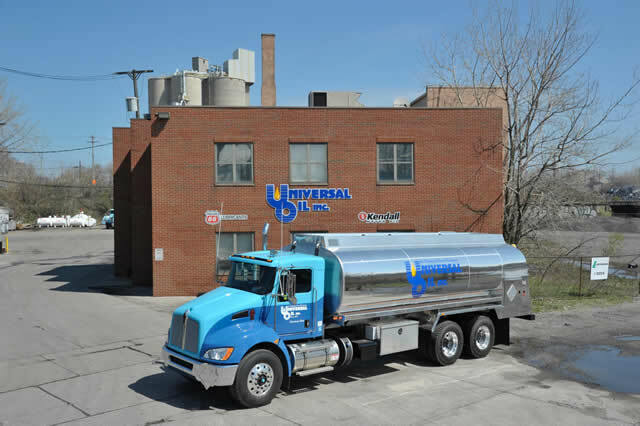 Universal Oil custom blends its own brand of industrial lubricants, including cutting oils, hydraulic oils, metalworking fluids and gear oils to name a few. Universal Oil also features Phillips66 lubricants to address commercial, construction, automotive, agricultural, and specialty market segments. Kendall, one of Phillips66 leading brands continues to build on heritage and be groundbreaking at the same time. In 2008, the exclusive Liquid Titanium Protection additive was introduced into its oils, providing fuel savings and exceptional engine wear protection, reflected in the expression, "Long Live the Engine." The Kendall brand is highly regarded in the passenger car and heavy-duty engine oil segments and continues to grow today through initiatives such as the Kendall YouTube channel, Kendall Motor Oil Facebook page and the grassroots Team Kendall racing program. Universal Oil carries a comprehensive range of high performance ethylene glycol antifreeze/coolants for commercial, automotive, heavy-duty, construction, off-road and agricultural applications. From conventional to heavy duty, our products will meet the latest ASTM standards as well as OEM (Original Equipment Manufacturer) approved chemistries. Universal Oil Diesel Exhaust Fluid (DEF) is a non-toxic solution engineered to help diesel-powered vehicles reduce emissions and improve fuel economy. DEF is engineered for use in Selective Catalytic Reduction (SCR) systems on diesel engines, diesel exhaust fluid is comprised of a high-purity urea and deionized water mixture that improves emissions and fuel economy. Diesel exhaust fluids must adhere to the ISO 22241 Standards. Universal Oil sells DEF in jugs, drums, and totes.